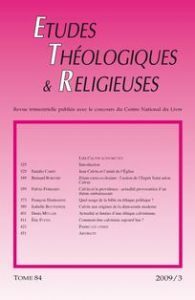 Études théologiques et religieuses > Articles > DERMANGE François > Quel usage de la Bible en éthique politique ? Calvin suggests two possible political readings of the Bible. The first one emphasises a formal, minimal and universal structure, which prefigures the human rights and probably indirectly the modern democracy. The other one leads to a radical project which uses power as the main tool for the elimination of impurity. François Dermange argues that behind this hesitation between justice and holiness, the relationship between the Reformer and power is at stake, as well as the ambivalence of the bringing-in of religion to politics.